When excess uric acid builds up in the body it can cause swelling or pain in the joints of your feet. This medical condition is known as gout (typically affecting middle aged to elderly individuals), and it is sometimes nasty. Gout pain can make your feet feel as if they are on fire. The attacks are intense and can manifest at the most inopportune times. There are four stages of gout. Each stage has varying symptoms and different treatment options. The first stage, known as hyperuricemia, is a result of too much uric acid building up in your bloodstream. If this condition progresses, the second stage of gout (known as acute gout) will manifest. Hyperuricemia causes crystals to form near or around your joints as a result of uric acid buildup in your bloodstream. 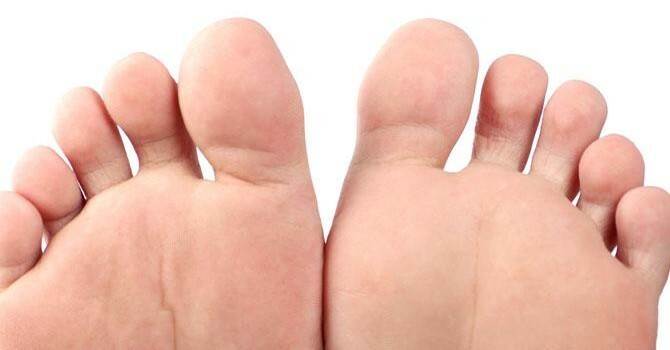 This affects the joints of your feet, causing them to swell, resulting in moderate to severe pain. In addition, acute gout can make your feet feel warm or hot. Gout is like most medical conditions. When left untreated, serious consequences and permanent damage may occur. For instance, if you’re gout attacks are several days long you most likely called interval gout, or stage 3 gout. It can be asymptomatic, but you should consult with your physician if the attacks continue month to month, or span a period of several years. If not, you might find yourself dealing with stage four gout consequences. Tophaceous gout occurs when gout is left untreated for a long period of time. Usually, it takes a decade or more to develop stage for gout. At this point, you will notice hard nodules in your joints, and possibly the tissue surrounding your joints. These nodules, known as”tophi”, can cause permanent joint damage. They can also show up in unexpected areas (like your ears). So Why Does Uric Acid Build Up in Your Bloodstream? There are several reasons you might be dealing with uric acid buildup. For instance, blood or metabolism disorders may contribute to gout, but there are other factors as well. Take diet and alcohol use for example. They play a roll with uric acid elimination and processing. Essentially, anything that could prevent your body from properly processing or eliminating uric acid can contribute to build up. In addition, anything that causes your body to produce an abundance of uric acid could also lead to build up. As uric acid crystallizes, you find yourself entering the four stage gout process. To help, avoid foods that are very salty, shellfish, sweet juices, organ meats (like liver and gizzards), as well as red meat. In addition, watch your alcohol consumption because too much will lead to a buildup of uric acid. Essentially, alcohol dehydrates your body which prevents it from eliminating or processing uric acid in an efficient manner. Finally, if you suffer from a kidney or thyroid disorder you could be at an increased risk for developing gout. The reason is some treatments for these types of disorders interfere with your body’s ability to properly process uric acid. Most often, treating gout requires help from your rheumatologist. Treatment plans will vary depending on your stage of gout, your general physical health, and the severity of your gout symptoms. Many treatments involve oral medication to help restore healthy uric acid balance to your bloodstream. This addresses the core problem. Yet, you could still experience painful symptoms. As a result, your doctor might prescribe an anti-inflammatory or something like colchicine to reduce your joint swelling or pain. In addition, they may also use corticosteroids. Over time, oral medicine will certainly impact uric acid buildup. However, you could still experience severe pain or swelling in gout affected areas. Therefore, compound creams are often use to alleviate symptoms still present. Once applied, they immediately work to provide pain relief. The reason for this is oral medications take time because they are dispersed through your bloodstream. However, topical gout creams are applied directly to the paint site, instantly affecting the area in question. This is beneficial for you. Yet, another benefit of using compounded pain creams for gout involve side effects. With compounded creams there are no adverse drug reactions. If you take multiple medicines for other medical conditions, applying a topical pain cream will not interact with those medications. As a result, compounded pain creams are popular because they work for just about everyone. When used properly, you will have very few, if any, side effects. So, if you have questions about your gout medication, or would like to know if a topical compounded cream could work for you, contact one of our IPS compounding pharmacists. We will be happy to answer any questions you have and work with your physician to come up with a solution that meets your needs.